For this year's VBS, we are creating our own and called it TLC: Trust, Loyalty, Commitment. We are studying these Old Testament people: Gideon, Esther, Joseph and Joshua. 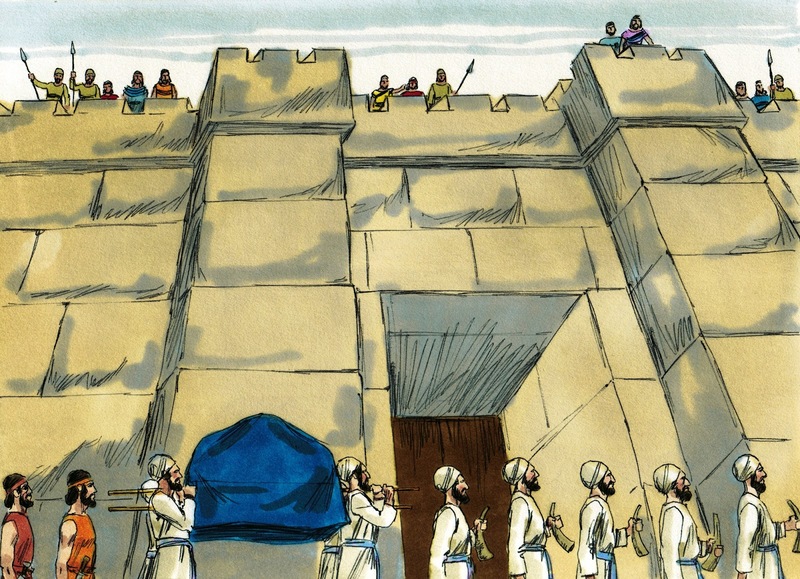 For the third night of Bible fun learning, we are looking at Joshua & The Walls of Jericho. I used my Ark of the Covenant visual with the priests. When we talked about Jericho, I showed the rams' horn. For our class handout, the kids picked a rock from the 'dry ground' of the Jordan River. Kids really love rocks! I used a Sharpie to write 'Serve the Lord Joshua 24:15'. These are just river rocks you can purchase anywhere. I used the fabric I have for Moses Parts the Water. Click here to see how to make it. I left the water closest to the wall wavy like water, and laid the other side over the dry ground after I spread out the rocks. When I taught the lesson, I talked about the oriests foot touching the water and we pulled back the water. I let the students walk on the dry ground and they picked up the rock to take home. Then, I stood in the center like the priests and talked about the 12 men picking up a rock. Then, I went to the bulletin board. I pointed to the Jordan River, then Gilgal and the memorial they made with the rocks. I kept the Joshua & Gideon bulletin boards simple and more as information boards this year. This has the scripture which you can download here. Also, the TLC main theme for this lesson words are here. This has the Jordan River on the right side and also the stones that were set up as a remembrance to God in Gilgal which you can print here. You see the mountains behind Jericho. It is a basic layout of the scene for the study of Joshua and the Battle of Jericho. Also, the red cord for Rahab. We stacked up boxes in the middle of the room for the kids to march around. As I told this part of the lesson, they walked around it (quietly) and we counted. Then they shouted and pushed Jericho all over! For our review game: We stacked up a couple of boxes and played Family Fued. We divided the kids into 2 groups and Paulette asked different questions about what they had learned during VBS. They remember really wierd facts! It was a fun way to end the week and good to know they learned the Bible! <3 I always love VBS! What cute ideas. I really like that Wall of Jericho!